over the past year or so, i've been more in tune with shifts going on in my work. this, along with some recent emailings back and forth with eva lake and reading her diary (specifically the 'who we are' post from july 11th) inspired me to narrow down some of my own perceptions on collage and my purpose as an artist. 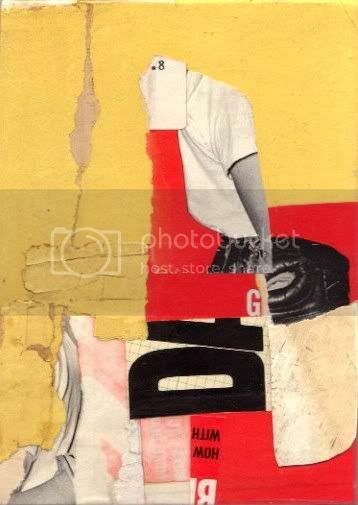 by focusing and immersing myself in this purist form of collage (paper to surface contact) i've realized both why i like this medium so much and why i like certain aspects of art objects in general. it's helped me to wake up..to finally translate some of the imagery that's been dancing around in my head. although i've been influenced by many, for the first time in my career, i'm hearing less static when my inner voice speaks. i'm not sure if this is due to maturity, diligence, or the divine. making art can be both meditative and medicative. it serves many purposes to many people, but it's one of the few occupations that can't be easily quantified or even justified. i sometimes wonder if i could've abandoned my art if i truly knew another way of life..if i were forced to make a 9-5 living. but, luckily i've never had to answer that question, thanks to all the support i've garnered, both financially and emotionally, through the years. it's not easy living with an artist, i'm sure chuckie can attest to that. we're not the types to punch clocks, so we're always working, if only in thought. our eyes are always open, our ears always listening...we're constantly drinking up the world around us, processing it and filtering it back out. it can be an exhausting yet invigorating life, the life of an artist...painful at times, but mostly rich with surprises and filled with an endless supply of hope. collage, for me, has been largely a conduit...a means to learn more about myself and the world around me. the immediacy of putting paper to surface has been endlessly gratifying. by working this way, in my experience, pieces tend to get less overworked, expressing more of a childlike innocence..like the right brain is speaking before the left brain wakes up. this process lends itself to my impatient mentality, but also carries a certain complexity that engages me to look further into the marks, smears and tears. this medium is also very tactile. very seldom does an instrument or tool come between me and the art thing. i often smooth the glue out with my hands, leaving fingerprints and imperfections. revealing the human touch has always been much more interesting to me than trying to replicate a sterile machine made object. i've also noticed something happening while i'm both making and viewing my collages. and this might be something all collagists feel at some point...but, i feel like i'm painting with paper. it's a strange and euphoric feeling when art takes you to places you never knew existed. i've never really considered myself a painter, but if i were, i'd want my paintings to come out looking like the collage above. the paper, depending on its thickness, age and texture can often take on painterly qualities, almost like impasto brush strokes that swoop and move across the surface. i'm getting excited just thinking about it. thank the gourd above i don't have to punch a clock..